Wow, time sure does fly! It’s already the beginning of March and I haven’t posted a new recipe in ages. Time for a change. 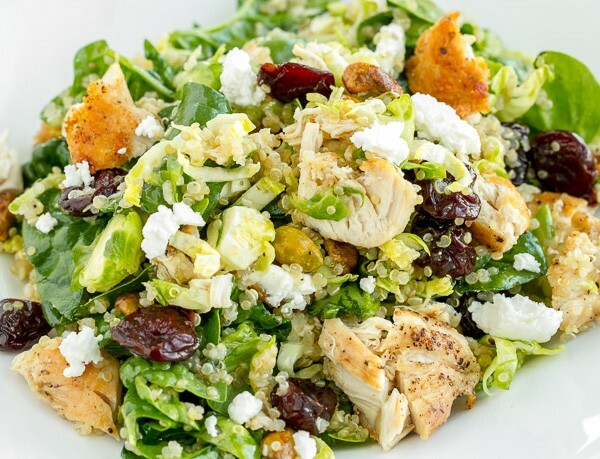 Yesterday I made this quick, easy and delicious Quinoa Cherry Chicken Salad for lunch so I thought now’s as good of time as any to hop back on the saddle and start blogging again! So before I sat down to eat I hauled out my camera gear and snapped a few quick photos so I could share this yummy dish with you all. Quinoa – If I’m making quinoa, I cook up a big batch to use throughout the week (or freeze in individual portions for later). I also like to use chicken stock for the liquid. 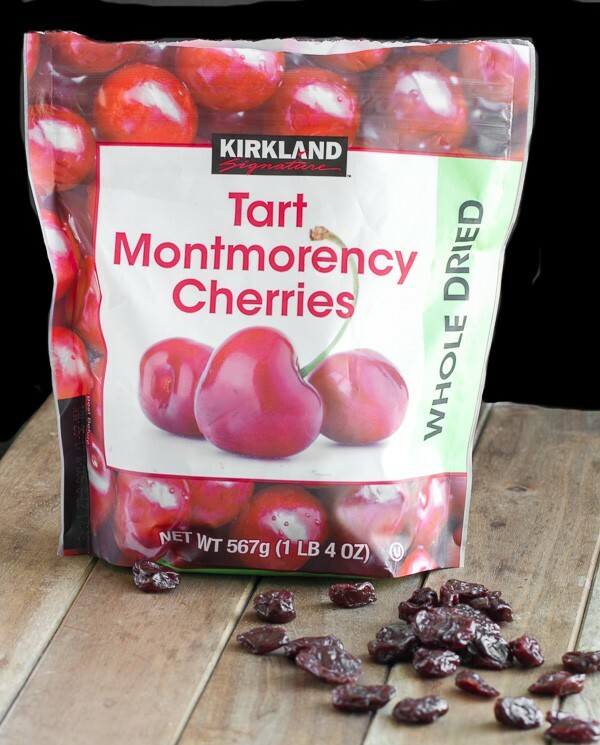 Dried Cherries – I found these awesome dried cherries at Costco and I can’t stop eating them. They’re tart but not mouth puckering tart. They still have some sweetness to them. They’re so plump, moist and chewy. Yum! If you go to Costco, toss a bag in your cart, you’ll be happy you did! Chicken – I used a couple of chicken tenders that I cooked up and diced. You could even use some already cooked rotisserie chicken from the grocery store if you wanted. Shaved Brussels Sprouts – I had a bag of small ones that I just sliced up. If you use big ones, you might want to cut them in half first. Or, pick up a small bag of already shaved sprouts at the market and save a step! Spinach – I discovered a fantastic farmers market in the Little Italy neighborhood just a few blocks from my condo. It’s every Saturday morning (so excited about that). I picked up a bag of curly spinach last weekend and used some in this salad. Pistachios – I’m loving pistachios right now and got a big bag of them already shelled at Costco so that’s what I used. I’m sure whatever nut you like would make a delicious crunch in this salad. Goat Cheese – First I was going to use some Feta that I had but decided the creamy mellow goat cheese would be a better choice. It was perfect! The amount of each individual ingredient can be adjusted to your liking. This makes enough for two good meal sized salads. 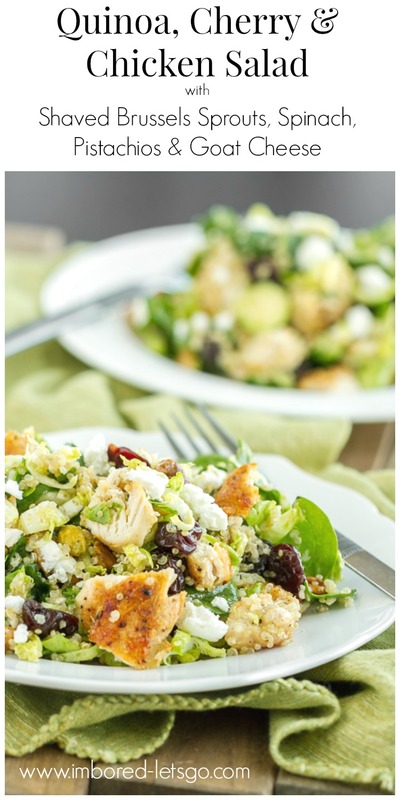 To finish it off, I tossed this Quinoa Cherry Chicken Salad in a simple white balsamic vinaigrette. I really hope you give this salad a try. It’s a winner! The amounts listed are just a guideline...you can adjust the amount of each ingredient in the salad to your personal preference. Make the Vinaigrette: Combine the vinaigrette ingredients in small bowl and whisk to combine. Set aside. 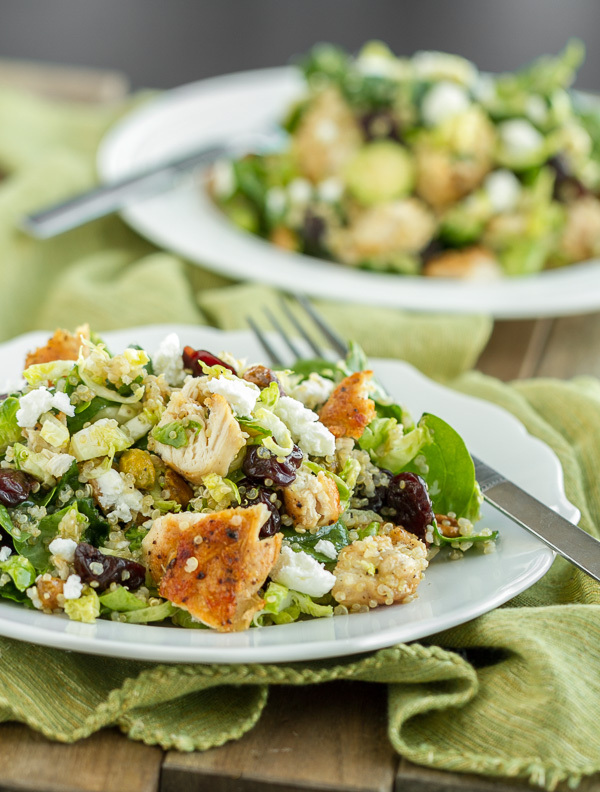 Assemble the Salad: Combine salad ingredients in bowl. Add vinaigrette and toss to combine. Catch up with me on FACEBOOK, PINTEREST, INSTAGRAM , TWITTER , or GOOGLE+, I’d love for you to follow along! Subscribe HERE and never miss a new recipe! Welcome back! I’ve been wondering what happened to you. So happy you’re enjoying SD. I’m so jealous! The salad (without the chicken and cheese) is totally my kind of dish. I love those cherries too, although I sometimes eat them like candy. Dangerous! I’ve been eating them like candy too! So very dangerous…but oh so good! Yum! I gotta try this. Love things with cherries. I still remember a pizza I had in Washington state a couple years ago. Wood fired with duck sausage and cherries. Wow, that pizza sounds amazing Suzanne! I love everything cherry ! The flavors and textures in this dish are wonderful! Sunny West Coast – lucky! I’m from cold Toronto. This salad looks so refreshing. Freezing quinoa is a great idea. How do you thaw them? Do you just pop each portion in the microwave frozen? Or leave them out on the counter and then…? I’ve never tried popping it into the microwave but I don’t see why it wouldn’t work. I just take out a portion in the morning if I think I’m going to use it that day or the next. I love raisins with chicken salads but this sounds much better with the cranberries!!!!!! I am obsessed with pistachios at the moment too. They’re expensive here but worth it. Salad sounds perfect for a Summer’s afternoon. Quinoa has to be my favourite all time grain. Such a powerhouse of nutrition and incredibly versatile. Wow this sounds great! I have some dried cranberries lying around the house, do you think this would make a good substitute? Thank you! Sure! Use them up. The dried cherries I used were bigger and seemed softer than dried cranberries but I think you could substitute any dried fruit of your liking in this dish. Enjoy!